It’s always startling to discover which celebrity deaths affect me. Ronald Reagan? “He was so old, man.” River Phoenix? Meh. 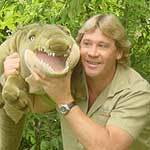 But Steve Irwin, the crocodile hunter? My heart aches. But why? I never watched anything the guy ever did. I always thought he was kind of goofy. But somewhere deep inside, I admired Irwin’s spirit, his enthusiasm, his vocation. He was a man living his dream. And so when I read the news of Irwin’s death last night, I went to bed in a funk. I dreamt of wild animals. I woke still sad. There are 2 reader responses to "RIP Crocodile Hunter".